KOUFAX ROOKIE!!! Presented here just happens to be one of the "hottest" cards in the hobby for one of the most iconic hurlers that ever toed the rubber. 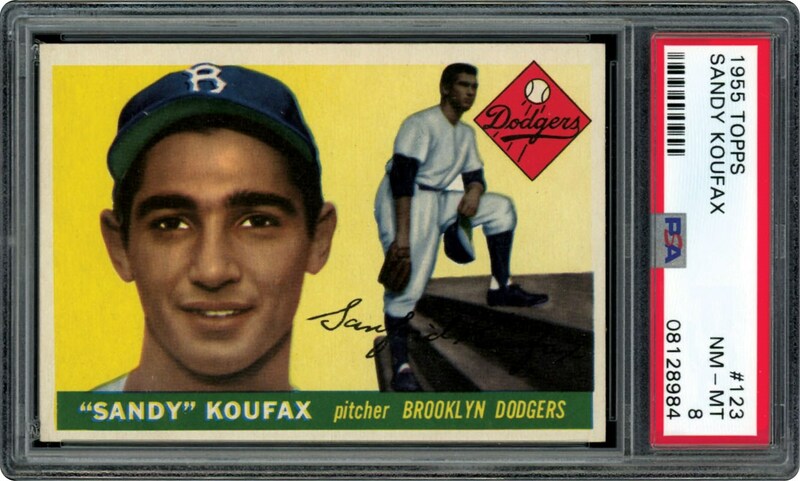 This magnificent PSA 8 Sandy Koufax 1955 Topps rookie card has been realizing extraordinary skyrocketing price tags. Along with the Mantle, Aaron, Mays, Clemente and Aaron rookie cards, the "Koufax Rookie" has officially joined those revered keepsakes as the most coveted 1950's inaugural cards with its ultimate value on a seemingly infinite journey. You will not get any arguments that Sandy Koufax, at peak value, was the greatest pitcher who ever lived. The radiant and virtually flawless background atypically depicts near-perfect centering between four absolutely blinding white borders. The pinpoint corner tips and razor sharp edging would be leading candidates to cut any surface, and the verso likewise depicts spectacular quality with both surfaces virtually immaculate. 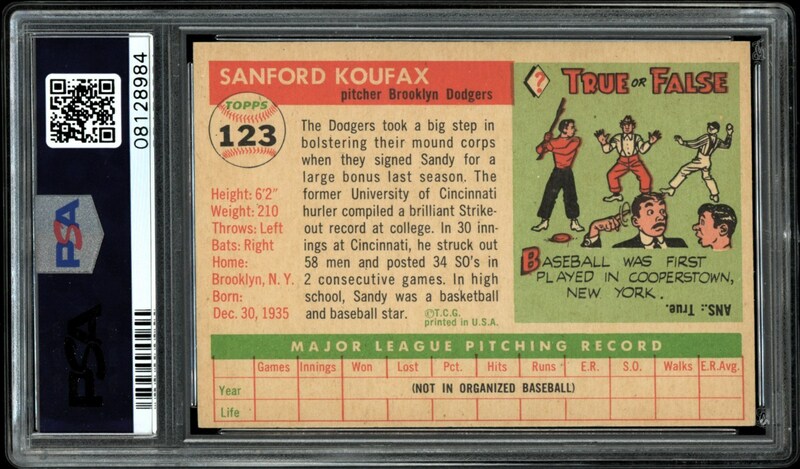 Over a 5-year period, Koufax set the ultimate benchmark for pitching excellence, with his 1955 Topps rookie card residing as his most exalted cardboard heirloom. While no one can guarantee how long the 1950's high-grade rookie card surge will continue, at this juncture it certainly appears that no end is in sight!